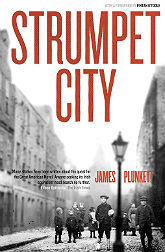 The programme for this April's Dublin: One City, One Book celebration of 'Strumpet City' by James Plunkett has been published, and it looks terrific. Published by Gill and Macmillan, the novel depicts a pivotal event in Irish social history – the mass lockout of trade unionists by employers in 1913 – and has a memorable cast of characters, not least the city itself. Inevitably, the figure of Jim Larkin looms large, for he was the person that inspired Plunkett through his inner city working class background to pen this epic novel of the 20th century. Written just 4 years after James Joyce’s Ulysses, Plunkett captures the spirit and soul of the city at the beginning of the twentieth century. It is written in the format of three books, each set at two-year intervals from 1907 through to 1914. Book One concludes as Jim Larkin addresses dockers from a rowing boat on the Liffey on behalf of the striking carters. Book two opens with the death in May 1910 of King Edward V11 and concludes with the loss of both legs of a Larkin activist in a horrific industrial accident. Book Three is devoted to the tumultous 1913 Lockout. Dublin: One City, One Book events run throughout the month of April and the programme offers all manner of ways to encounter or re-engage with this outstanding book. From lectures and readings to music and exhibitions. Goodness, there's even a bike tour!